I have owned the Cross House for fourteen month. And finally had a party! My first! 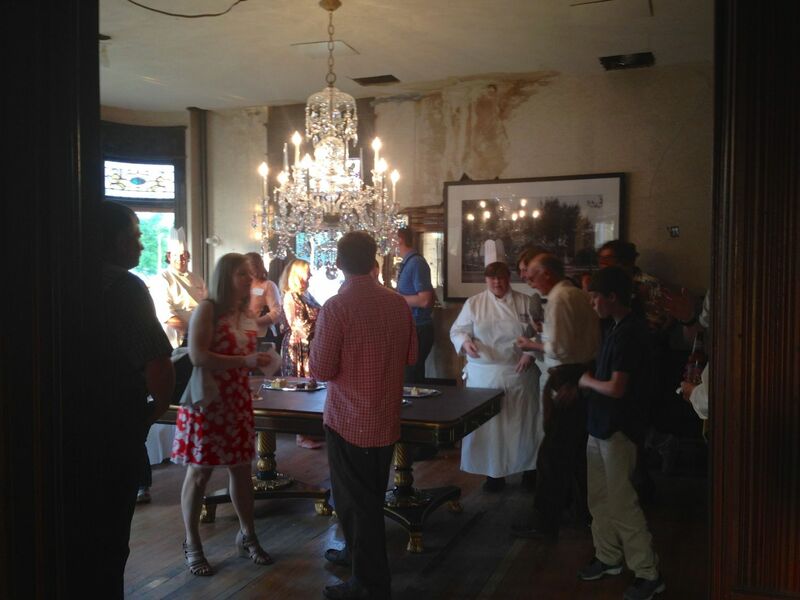 The event (May 1st) was to celebrate the Cross House receiving a Heritage Grant, and the guest list was composed primarily of individuals I wanted to thank for making the grant a reality. I also invited those who have been helping to restore the house. 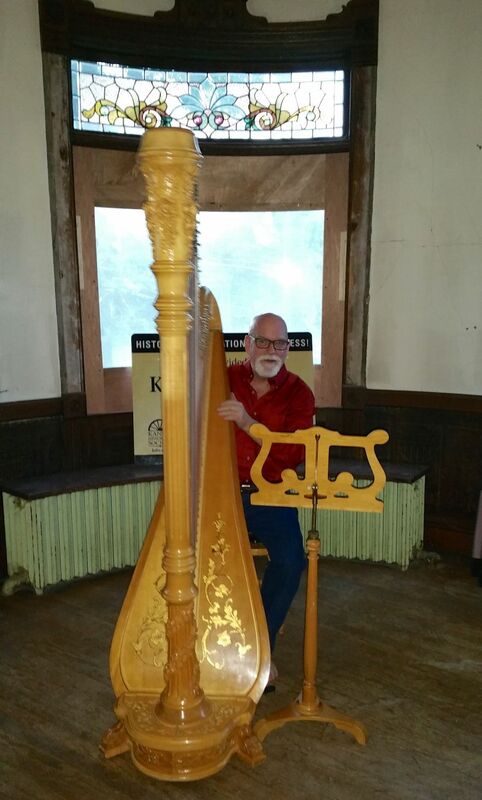 The round reception room seemed ideal for a particular musical instrument, and no other: a harp. 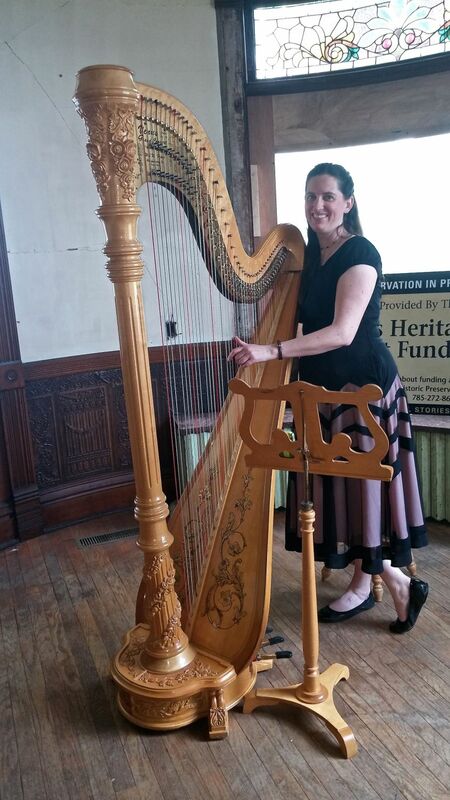 After much searching (harpist are rare), Erin Wood graciously and splendidly played for the evening. Image courtesy Michielle Cooper. While Erin provided the music, Brian Romano (the head chef at Flint Hills Technical College) provided tray after tray after tray of delectable morsels. Image courtesy Michielle Cooper. 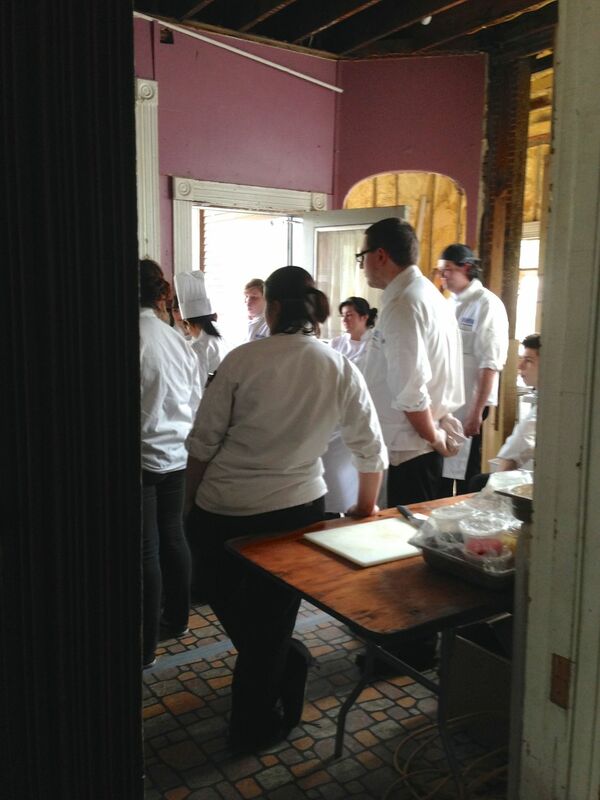 Brian brought in his students, a lot of them, and I was startled to see my wreak of a kitchen suddenly spring to life! I had managed to get a sink installed for the event (cold water only) and three rented folding tables (as there are no counters)! 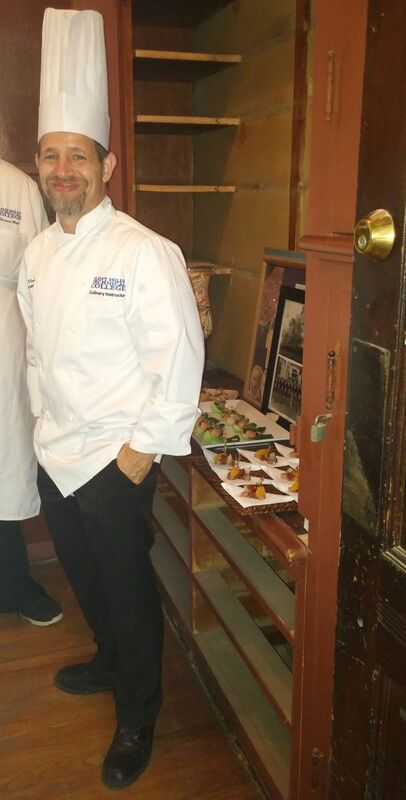 In likely more surreal surroundings than Brain and his team will ever again experience, they nonetheless managed to provide excellent food and service. Amazing. The wreak of a dining room also sprang to life. Astonishing! I was hoping that my guests would be so dazzled by the newly installed glittering chandelier that they would not notice the decaying/missing plaster on the walls and ceiling. As the evening progressed, and after spirits were consumed, I suspect that this proved true. One of my favorite movies is The Bishop’s Wife, starring the incomparable Cary Grant. It seems tragic that young people have no idea who this magnificent actor was, and countless other great actors. Sigh. 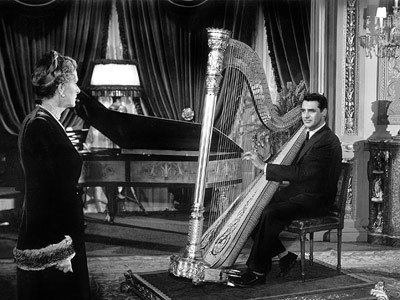 Anyway, in an important scene in the movie, Grant plays a lovely song on a harp, to the astonishment of Mrs. Hamilton (deliciously played by Gladys Cooper). I have long loved this scene, and it should not be surprising that harps imprinted on me as a result. Just after Erin arrived, I told her about my love for The Bishop’s Wife, and The Scene, and she replied: “I love that movie! And that scene!” When the party was over she insisted I have a Cary Grant moment. Well, I look just like Grant! Right???? Right???? Image courtesy Brandon Stiner. And thank you, Erin. 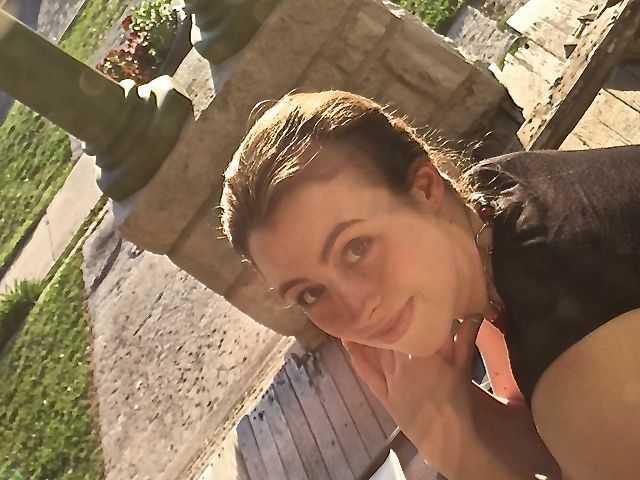 At the last minute, Breanna Gilger stepped in to act as the Gatekeeper of the Door. Image courtesy Scott Wiltse, and a beautiful image it be. A week has now past since the party, an incredibly busy week. My business consumed much of it, so this post will be Part I, and with more to come! 7 Responses to A Gala at the Cross House. Part One. I know who Cary Grant is, does that make me old? Is 34 considered old?? No, 34 is not old! But you are the RARE young person who knows about Grant! Hi Ross! Just stumbled across your site yesterday while googling restoration tips. Coincidentally, I am also an avid lurker at Old House Dreams, and as I started reading, I thought, “Cross House sounds familiar…could this be THE Cross House? THE Ross with whose opinions I always seem to agree on Old House Dreams? !” sure enough! I just wanted to thank you for this site, this glimpse into your awesome house, and your reasoned pro-restoration arguments! I have parroted your thoughts on replacement windows with righteous indignation, when my husband suggested replacing ours. We have a tiny 1920 craftsman time capsule (original kitchen cabinets, solid wood doors, windows, hardware and most of the lighting, unpainted trim, built-ins, and original floors), and I intend to keep it this way. Anyway, it’s been so much fun reading your story, and I can definitely understand why you love your house…I think I love it too! So gratifying to see it returning to its former glory! Thanks again! I agree with Violet, and I also always call it THE Cross House, giving it the respect it is due. I also think it’s cool that Ross’s name is contained within it, so it could read, The cRoss House. You’ve only been at the Cross house for a little over a year and your progress is outstanding! You are a true craftsman and your work shows beautifully. I bet the Cross House is glad to have found you. Matt, this is high praise, indeed, considering the extraordinary dedication (and fine eye) you have lavished on your fabulous house.